A rare deep diving whale rescued from a Maui beach earlier this month has died after spending two weeks at a dolphin and whale hospital on Hawaii’s Big Island. 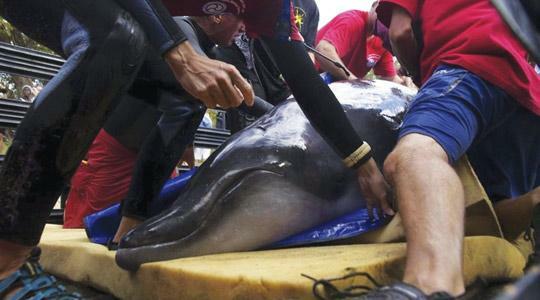 Tests showed that the male Blain­ville’s beaked whale had moderate pneumonia a severe gastrointestinal problem and kid­ney disease. Each of these diseases could have killed the animal. It was not clear how the whale contracted the illnesses, although a viral infection was one possibility. A power substation in Russia’s Volga region of Tatarstan partially crumbled after what officials said was a “bang” and cut power to the homes of around 80,000 people, authorities said yesterday. The officials however refused to say that an explosion caused the accident in the region’s main city of Kazan. No-one was hurt in the accident but the ensuing power cut affected over 230 residential buildings as well as a hospital and three kindergartens, the ministry said. A large “panther-type” cat has been spotted in the Scottish Highlands, police said. Northern Constabulary is investi­gating two sightings of the four-foot-long creature in the past week. New Zealand officials have allowed a motorist to keep her licence plate “ARYAN 1” because it was intended as a gesture of affection towards her former partner, not a statement of white supremacy. The NZ Transport Agency investigated the plate after a member of the public complained that the term Aryan, used by Hilter’s Nazis to describe the so-called “master race”, was offensive. But the plate’s owner, Lisa Marie Thompson, successfully argued in favour of keeping the plate, saying it simply comprised the initial and surname of her former boyfriend – Andrew Ryan – and had no racial overtones. French writers yesterday launched an appeal to save an Iranian teenager sentenced to death by hanging for allegedly being homosexual. “Ebrahim Hamidi is 18 years old and is going to be hanged,” said the appeal by Philippe Besson and Gilles Leroy in Le Monde news­paper and signed by French intellectuals. “After Sakineh Mohammadi-Ashtiani, condemned to death by stoning for adultery, Iran persists by sentencing to hanging a young man suspected of homosexuality,” they wrote. Mr Besson and Mr Leroy’s petition said that the charges against Mr Hamidi were false and had even been withdrawn by his alleged “victim”. English Heritage has joined forces with Pizza Hut to bring back the tastes of the Middle Ages in the form of mediaeval-inspired pizzas. As part of a month celebrating mediaeval feasting at the Great Tower at Dover Castle in Kent, the restaurant chain has helped create medieval variations of three of its most popular pizzas with toppings including pigeon and eel. The American jazz and blues musician Bob Lenox has died in his adopted home of France at the age of 65, his producer said yesterday. As a pianist, singer and composer combining jazz, blues, folk and rock, Mr Lenox worked with big names such as Jimi Hendrix, Tina Turner and Joe Cocker as well as in his own bands, and also composed music for films.